SAMQG is doing pet post cards as a charity outreach project and the cards will be available at the Houston Quilt Show 2014. 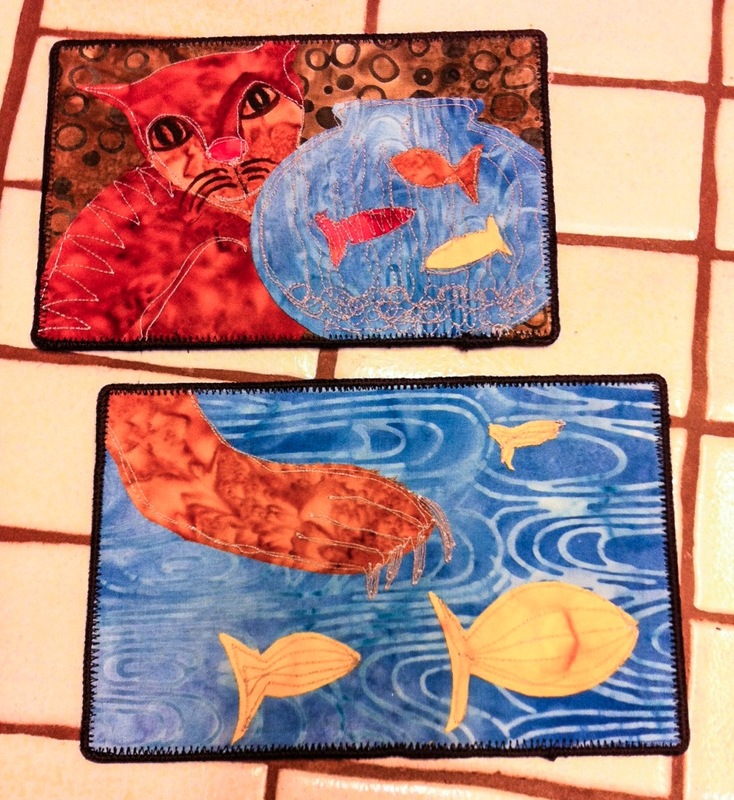 I was inspired to make these by a memory of my bad cat who tormented my fish. Actually, I always thought the fish were tormenting the cat. He never managed to catch a fish. Though he did get wet. We made post cards that used all kinds of techniques. My Bad Cats are raw edge appliqué and have a rat tail cord art quilt edging method to finish them off. The rat tail cord edging is actually pretty easy. First use a narrow long zig zag to seal off the edges of your quilt sandwich. Then widen your stitch just a teeny bit, lay a rat tail cord right next to and touching the edge and zig zag it on the quilt. THEN, widen your stitch just a bit more and change the length so it is not quite a satin stitch. Since you stitched around twice already, there is enough thread already laid down that a true satin stitch won’t be necessary for a neat and pretty finish. I’ll show in some future post how to make the ends of your rat tail edge meet up nicely. Previous Previous post: Life is short, you don’t know what might happen tomorrow, so LIVE it, LIVE ALL OF IT!